Everything seems to be a joke in the eagerly awaited trailer of Rajkumar Hirani's "Sanju", based on the life of Sanjay Dutt. A cruel joke told in the form of a psychedelic fable replete with visuals of Sanju baba aka Ranbir Kapoor, high on drugs, so high that he can't tell the difference between a laugh and a cry, or a mangalsutra and a toilet seat. In a sequence meant to be deafeningly shrill in its hysterical repudiation of a traumatic marriage, Sonam Kapoor Ahuja shrieks for her missing mangalsutra, and her high-as-a-kite husband drapes her neck with a toilet seat. Toilets occur twice in the longish trailer. The second time we see Sanju in a dingy prison cell panicking as the inbuilt toilet vomits yellow liquid excreta in nauseating bubbles. 'Sanju' showcases the highs and lows of Sanjay Dutt's life-giving an insight into the unbelievable true story of the actor. While the teaser earned Ranbir Kapoor praises for his amazing transformation into each phase of Sanjay Dutt's life, the trailer further resents the actor's commendable acting skills as he perfectly fits into Sanjay Dutt's shoes. 'Sanju' is all set to be released on 29th June 2018. Sanju Trailer pics: The unimaginable life journey of Sanjay Dutt and his mistakes, Ranbir Kapoor nail everything. Sanju Trailer images: The unimaginable life journey of Sanjay Dutt and his mistakes, Ranbir Kapoor nail everything. 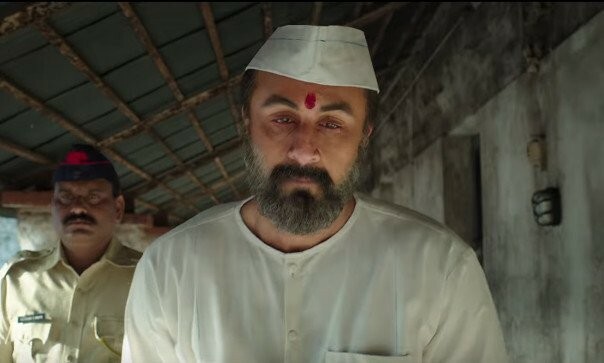 Sanju Trailer photos: The unimaginable life journey of Sanjay Dutt and his mistakes, Ranbir Kapoor nail everything. Sanju Trailer pictures: The unimaginable life journey of Sanjay Dutt and his mistakes, Ranbir Kapoor nail everything.